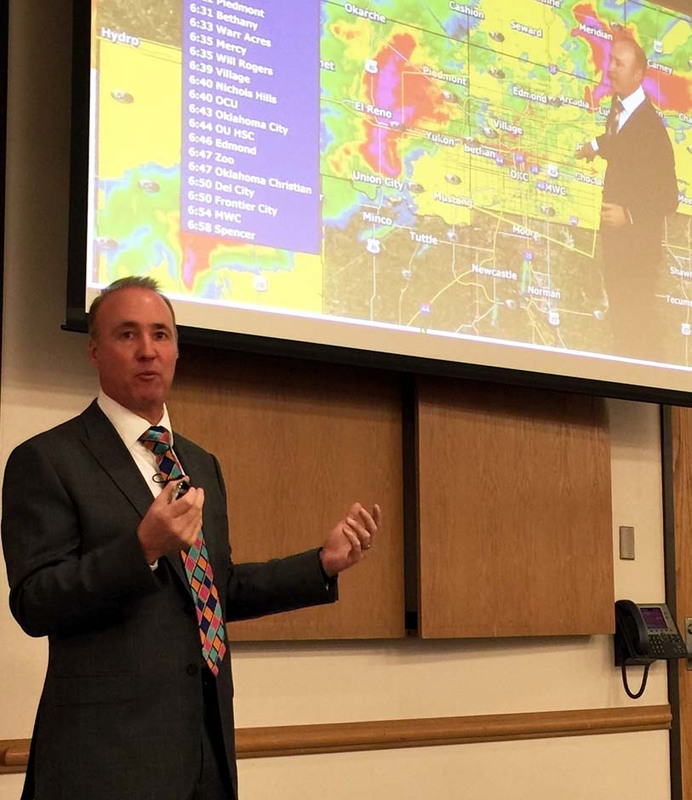 Former OCCC student and KWTV News9 Chief Meteorologist David Payne spoke to about 240 students Feb. 9 morning in the College Union about severe weather and weather safety. Payne discussed previous severe weather events, a forecast of this year’s severe weather season, and how to be safe in severe weather. Severe weather can happen anywhere, Payne said. Payne focused also on flash flooding. “Areas that didn’t flood 15 years ago are now having flooding problems,” Payne said. “It only takes 6 inches of water to knock an adult off their feet, and just 2 feet to pick up a car,” he said. He said flooding kills more people in the U.S. annually than any other weather event. Payne also gave the audience an outlook into this year’s spring. “I think our severe weather season will be a little delayed this year, but not by much,” he said. He said it’s also important to cover as much of your body as possible to protect against flying debris. Payne said that when severe weather strikes, viewers can stream News9 severe weather coverage right on their smartphones. He said the most important advice he can give is to always have a plan. To learn more about severe weather and what to do when it strikes, visit News9’s website at news9.com/weather.